It’s IEP Season! Are you toting the right stuff to IEP meetings? 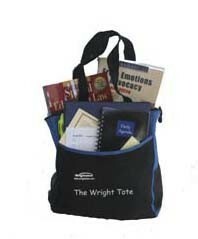 When you take The Wright Tote to your next IEP meeting, you’ll know the power of getting organized! Check out our three new tote options in the Advocate’s Store. Special Introductory Offer is available from April 1 – April 10. Order today! The Wright Tote is the perfect size for on-the-go storage and organization of your child’s records, special education file, and IEP notes – all in one place! This entry was posted in Advocacy, IEPs, Strategies and tagged Advocacy Supplies, IEP Team, IEP Team Meetings, IEPs, The Wright Tote by Wrightslaw. Bookmark the permalink. Both books are current. The books will be revised after the Individuals with Disabilities Education Act is reauthorized. This law will not be reauthorized soon. Our staff came up with the idea of The Wright Tote and the IEP Kit several months ago. They investigated companies that make promotional products, designed the tote, decided what to include in the IEP Kit – they did a fantastic job. In January, we did a fundraiser for the new Special Education Advocacy Clinic at William & Mary Law School. The law students enrolled in the Clinic help parents get better services for their children. Pete and I also began teaching a Special Education Law & Advocacy course as adjunct law professors. One goal of the clinic and course is to increase the number of attorneys who can take on these cases. At the fundraiser, the dean of the law school gave us ball caps and shirts embroidered with the words Wrightslaw Army. If folks have ideas about other useful and/or fun products, let us know!